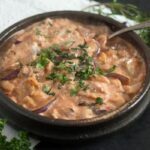 A very easy to make and delightful Iranian recipe for eggplant or aubergine and tomato dip with yogurt. What can I say about this Iranian or Persian eggplant dip? 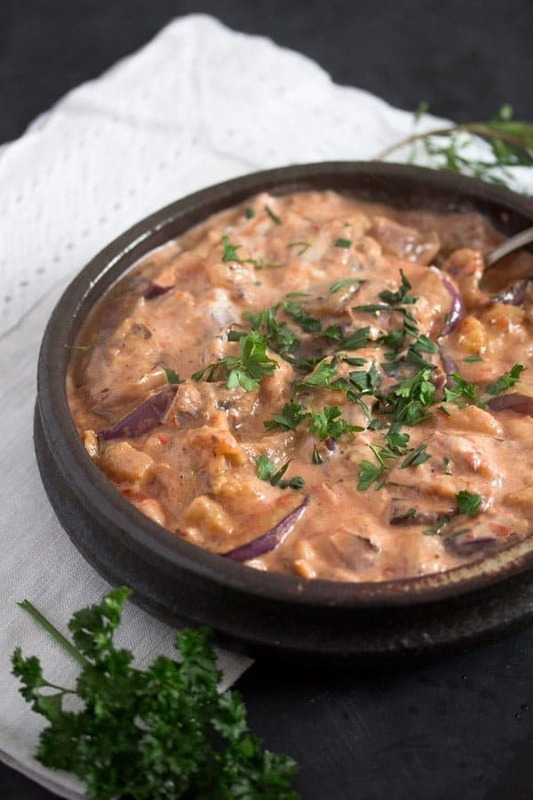 It might not look like a dish you might want to cook straight away, not like one of those Facebook videos of oozing cheese or glazed meat, but when it comes to taste, this Eggplant Dip with Tomatoes has no reason to be modest. 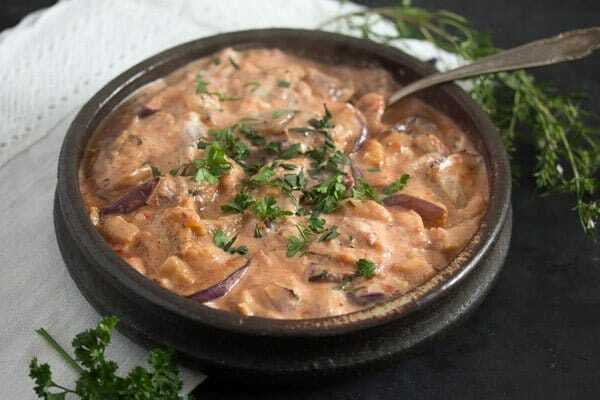 Provided that you like eggplants/aubergines, you will totally love this dip. Or should I call it a stew? I would rather call it a stew when eating it warm and a dip when eating it at room temperature. I’ve had this dish both ways and I liked either way. I do love eggplants myself and despite the fact that my family is really not an eggplant fan, I do cook eggplants quite often. Maybe not as often as I would if all the rest here would be so enthusiastic about eggplants as I am, but still I don’t give up. 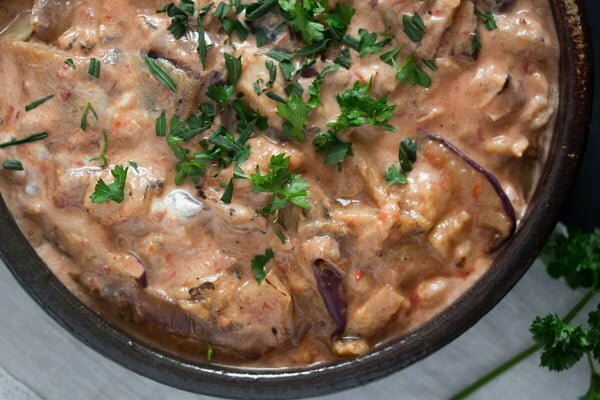 I did have some success with this Romanian Roasted Aubergine/ Eggplant Salad – Vinete – my husband likes this one. 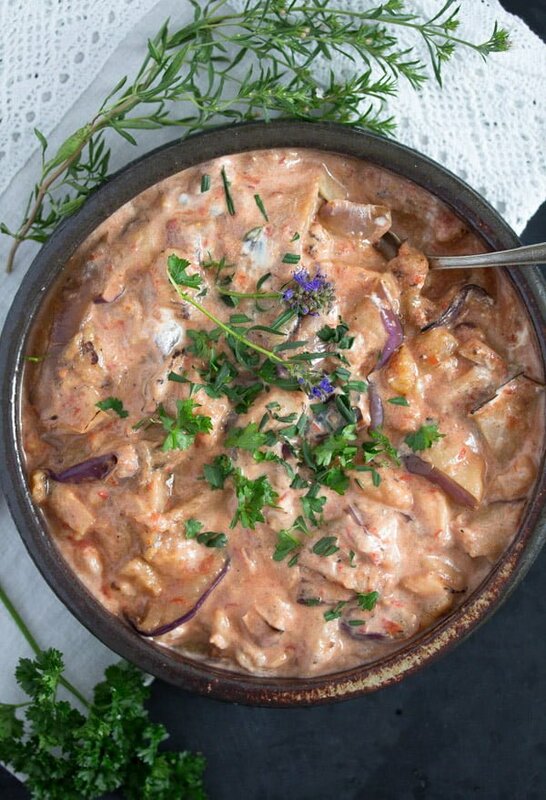 And all of them adore the Romanian Eggplant and Red Pepper Spread – Zacusca and the Spaghetti with Eggplants. I chose to make this Iranian dish mostly because I just happened to have a rather large and completely round eggplant in the fridge. I had bought that on a whim, just because it was so special, not the kind of regular long eggplant we get around here. So, I had to do something with it and I wanted something new, vegetarian and refreshing. This Persian Eggplant Dip with Tomatoes is not only healthy and delicious, but it is also very easy to make. You need a little time to fry the aubergines, but that’s an easy task, I would say. And the resulting dish is so comforting and good, you will not care about having spent some time with frying the eggplants. Salting or not salting the eggplants? 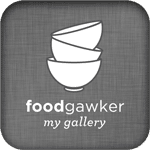 I have been battling with this for years… My grandmother always did it when she made her fried eggplants with garlic sauce. She said that normally the eggplants are quite better and the salt would help remove that bitterness. That is right, salt makes things less bitter. However, nowadays eggplants are grown that way as to not be as bitter as they were in the past. So, you would think that salting would be quite unnecessary. And when it comes to taste, it probably is. Unless you have really large and old eggplants, which might be slightly bitter, I don’t think you have to bother much about the bitterness. You can recognize an older eggplant by its size and especially by the state of its seeds. If the seeds are brown, the eggplant is older and you might want to salt that, let it sit for half an hour, wipe it dry and then cook it. Another reason for salting the eggplants before cooking them concerns the amount of oil they absorb. Eggplant do absorb the oil unbelievably quickly, quicker than any other vegetable I can think of. That never bothered my grandmother much, she used to use huge amounts of oil in her cooking, so 100 ml more or less in a dish really didn’t bother her at all. So she never mentioned this oil thing to me. But it does bother me though. So, in an attempt of reducing the amount of oil I need when frying eggplants, I do salt and let my eggplants sit for a while before cooking them. But, nowadays, only when cooking whole eggplant slices like those needed for this recipe for Persian Eggplant Dip with Tomatoes. If I make a dish similar to this Pasta with Eggplant and Cheese Sauce or an eggplant stew or curry where the eggplants have to be cut into smaller cubes, I don’t salt the eggplants anymore. is rather important in this case. As mentioned above start with salting your eggplant slices. Let them sit for 30 minutes, wipe them dry with kitchen paper and fry them in batches preferably in a non stick pan. Only add one tablespoon of the oil at the beginning and add the rest between the batches. Using a non stick pan will also help you use less oil when frying the aubergines. In the meantime deseed and puree your tomatoes together with the garlic cloves. Use ripe, sweet tomatoes. If you cannot find any, you can use the same amount of drained tomatoes from a can. Give the fried eggplant slices to a medium thick bottomed pan, add the pureed tomatoes and the hot vegetable broth (made from a cube, if you don’t happen to have homemade vegetable broth) and cook the dish until the eggplants are really really soft, so soft that you will be able to break them into chunks just by stirring them with a spoon. This will take between 20 and 30 minutes. At this point take the pot off the heat and add the Greek yogurt. 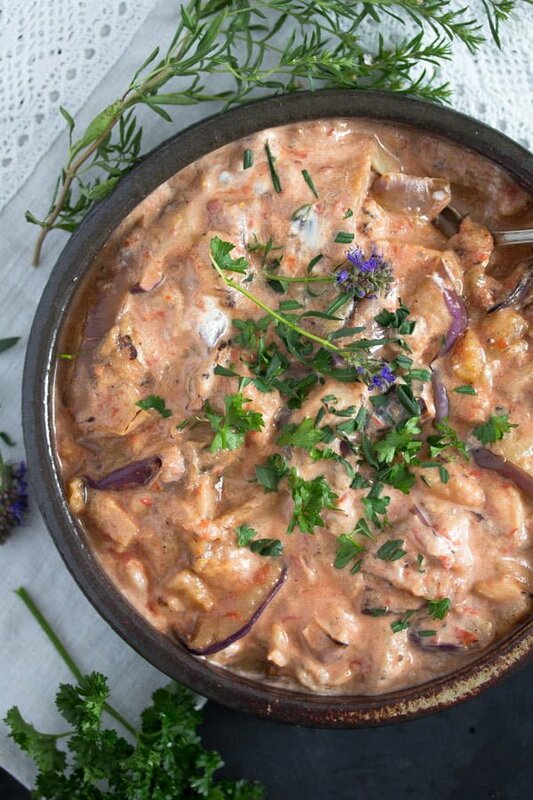 Using a creamy mild yogurt is important, it makes the dish so incredibly comforting yet still somehow refreshing. Adjust the taste with salt and freshly ground black pepper and stir again. The eggplant pieces should be broken into smaller chunks, but still retain some texture and not be turned into a pulp. You can serve this eggplant dip warm or at room temperature. When warm I had it once with French baguette and once with cooked rice. I loved it both ways. When at room temperature we had the aubergine dip with flat bread or spread on top of regular bread. Lovely! The Persian Eggplant Dip with Tomatoes can be reheated. Heat it gently, but don’t let it come to a boil again. I don’t think this dish to be suitable for freezing. Cut the eggplant into 1 ½ cm/ ½ inch thick slices. Spread them into a large colander, sprinkle them with salt and let sit for 30 minutes. Use kitchen paper to remove the excess salt and water.
. Fry the eggplant slices in batches until golden on both sides, adding more of the oil between the batches. Place the fried eggplants slices onto kitchen paper to remove the excess fat. Deseed the tomatoes and puree them together with the garlic cloves in the food processor or with the help of an immersion blender. Add salt and pepper to taste. 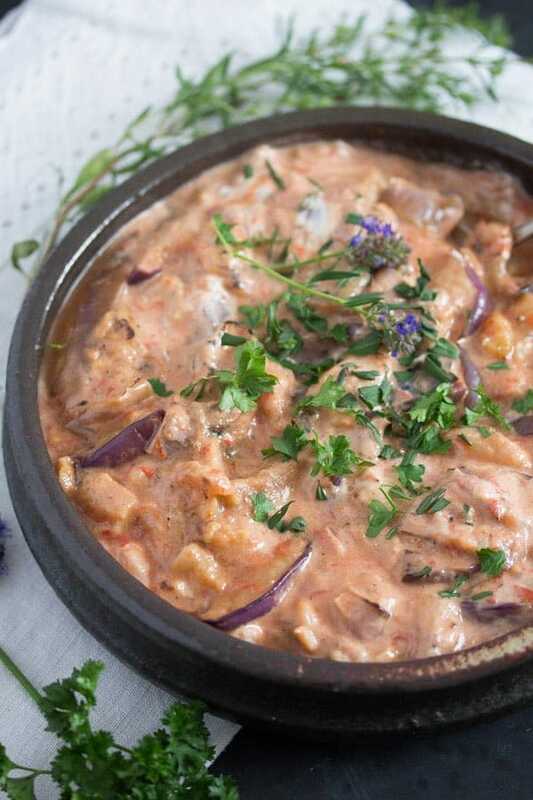 Arrange the eggplant slices into a medium thick bottomed pot. Pour the tomato sauce over the eggplants and spread it evenly. Pour the hot vegetable broth into the pot and cook the dish, uncovered, for 20 to 30 minutes or until the liquid evaporates and the eggplants are really soft. Add the yogurt and stir gently to break the eggplant pieces. Adjust the taste with salt and pepper. Use ripe and sweet tomatoes. If you cannot find good ones, use the same amount of canned and well drained tomatoes. Weigh the canned tomatoes after draining them. yummmmmm! i never even think of making a dip using eggplants..This is brilliant.